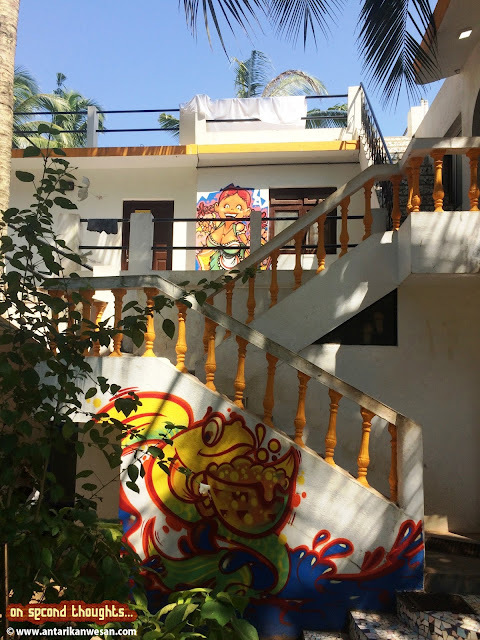 Away from the hustle of the crowds, amidst trees and colourful villas, in the middle of a true Goan village but located less than half a kilometre from the main road, we were already in love with the location of the Backpacker Panda hostel before getting down from the scooties. More was yet to come. Few months back I got a stay and review invitation from a chain of hostels called ‘Backpacker Panda’ at their Goa or Udaipur property. With a trip to Goa in the offing and my friends remaining undecided on the stay for the last two days, I offered that we try out the hostel scene in Goa. We anyways needed a place where we could simply dump our bags and go out, and so, the cheapest place with security was all we were actually looking for. The idea of staying in the hostel was well received by everyone and we went ahead with the bookings. One night stay for me was complimentary from Backpacker Panda. I was still a little apprehensive about ‘backpacking hostel stays’, having never experienced it and only having seen it in ‘Queen’. And I wasn’t really sure what idea of a ‘hostel’ my friends had and if the place would stand up to their expectation. Well, let me just say, we were all impressed. 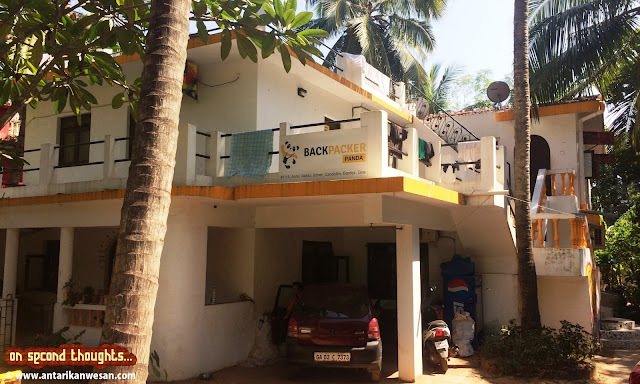 After having a little difficulty in explaining the location to the taxi driver, we all managed to drive our rented scooties and reach Backpacker Panda hostel, located near the Candolim Beach in North Goa. We parked our scooties near the ‘Den’ that housed the reception and sitting area. A few hostellers sat there with bottles of beer or juices in hand, some reading a book, some playing chess, and some just lazying around. The first impression had been made. Within minutes we had termed the place ‘cool’. We met Dikshita and Melfree at the reception. They verified our booking and since we had arrived 2 hours before the check-in time, requested us to wait until the rooms were cleaned. The check-in process was smooth. The official check-in time is 2 PM, but they gave us our bed keys an hour early as we just had to lock our bags and leave for the day’s plan (They also didn’t charge my friends extra when they checked-out 3 hours late the next day. We wished we had taken down their number and informed in advance though that we were going to be a little late). One thing I loved during the check-in was how unequivocally they asked for each one of our IDs for security verification, something that probably even hotels never do. It is usually just the person who booked who needs to provide an ID. The wifi was something that I thought their website talked about a lot, and I wasn’t disappointed after the initial connection issue on my phone. The speed was great, although the connection is limited to the seating area (The connection in our room was very limited). 1. Be it water, Oreo biscuits, juices, or beer- it’s all available at a fixed rate of Rs.50. 2. 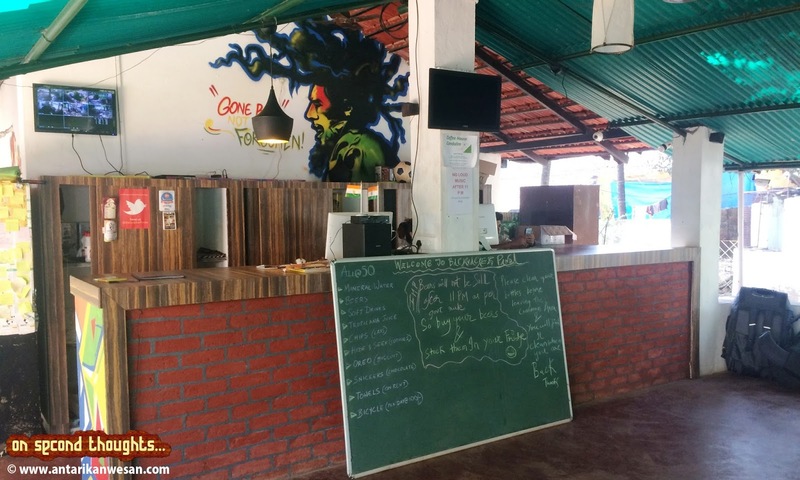 All the dorms are named after the beaches in and around Goa- Varkala, Gokarna, and so on. There is graffiti on the walls and it looks inviting. 3. There are 42 beds available in various dormitory configurations- 4, 6 and 8 bed. The rooms are quite spacious, although I don’t know why the photos of the rooms on their website make them look a little cramped. 4. The lockers located below the beds are good. There are charging points and reading lights conveniently attached on every bunk. 5. The washroom in our 8-bed mix-dorm was huge. Although I did feel that separate toilet and bath areas would be more convenient. 6. 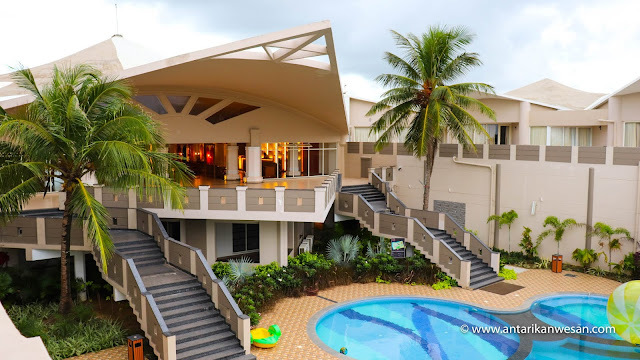 The Candolim Beach is just 100 metres away from the property and a winding sandy road through the village with colourful villas all around takes you to the white sand beach. The shacks and restaurants are a further walk away. 7. You can order food from various outlets, cafes, shacks near the place. The receptionists Dikshita and Melfree, or even the night guard Siddhant are of great help. 9. There are CCTV cameras around the compound adding to the security. 10. One can hire bicycles at a rate of Rs.100 per day. Scooties and bikes can be hired from the many shops on the main road located less than half a kilometre away from the property. I loved the randomness of the question and the prospect of having a party with strangers a.k.a. fellow backpackers from across the world but sadly had to decline the offer as my departure was scheduled in a few hours. I wished I could stay for longer, but prior commitments had to be adhered to. 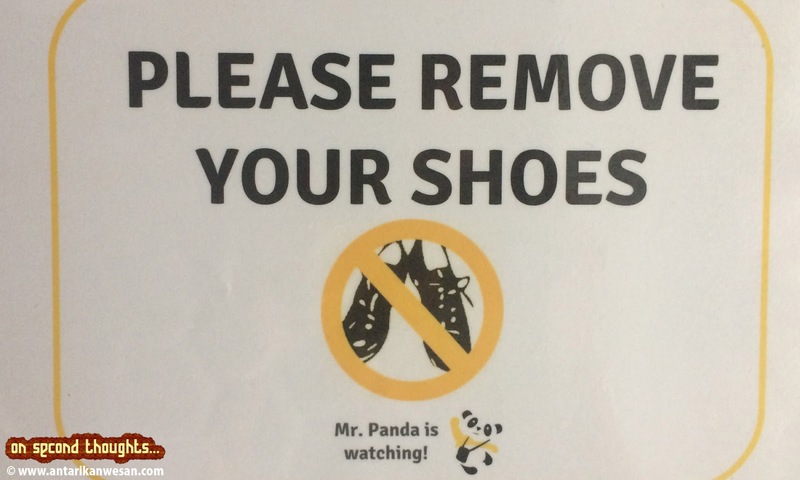 But the stay at Backpacker Panda has made sure I would book these modern hostels again. I had a few last minute questions for Dikshita before leaving. “Do you get more Indians or foreigners here?” I asked Dikshita. “Definitely more Indians,” she replied and I was surprised. Due to the short time I was there for, I missed chilling out with the other backpackers. Probably I would have loved to have a game of Jenga or Chess or go through the books on the shelf. My suggestion: Put some good amount of time simply to experience the vibe of backpacking here. The setting, the coolness factor attached to it, the simplicity and the entire vibe of the place is something amazing, something that all of my friends (including the girls) and I loved. 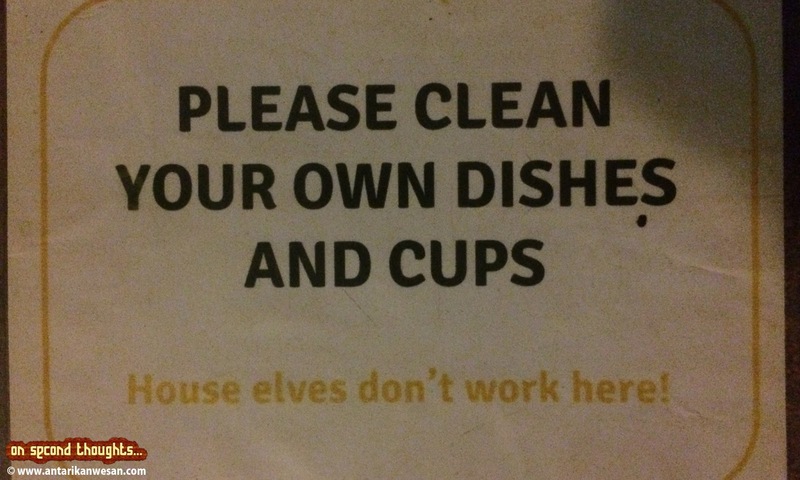 I would definitely recommend a stay at the hostel, and a long one at it preferably to experience it. 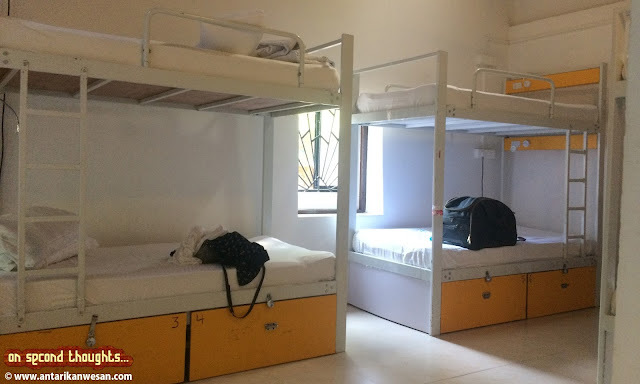 Hostels for backpackers is an European concept and is rapidly gaining fascination and acceptance in India. Mostly common amongst the youth in touristy locations, the hostels provide a safe chilled-out atmosphere at cheap prices. These are places where you can dump your luggage and go on your day tour, or just sit calmly and enjoy, and be with friends or make new ones. These are definitely not recommended for families or couples who might be looking at having a lot more privacy for themselves (Unless these hostels have separate arrangements for them as well that I am not aware of). Backpacker Panda Hostels are currently hosting travellers at Goa, Mumbai, Jaipur, Udaipur, Agra and New Delhi. You can book beds in advance on their website here. 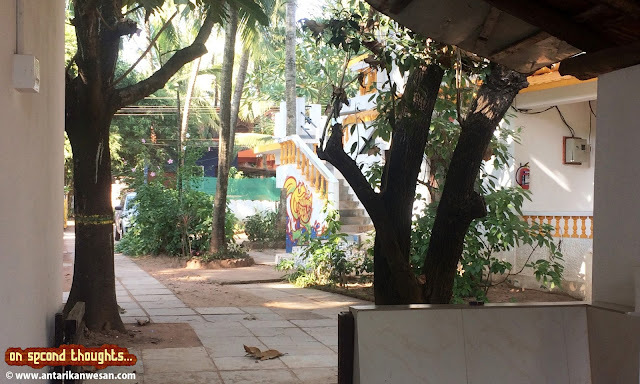 I was invited by Backpacker Panda for a FAM stay at their Goa property for a night in November 2016. 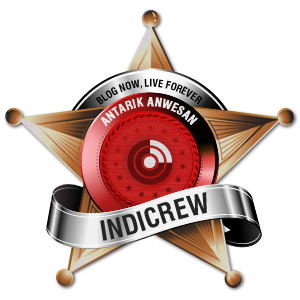 All views and opinions in the post are completely personal. Very informative. And well presented. 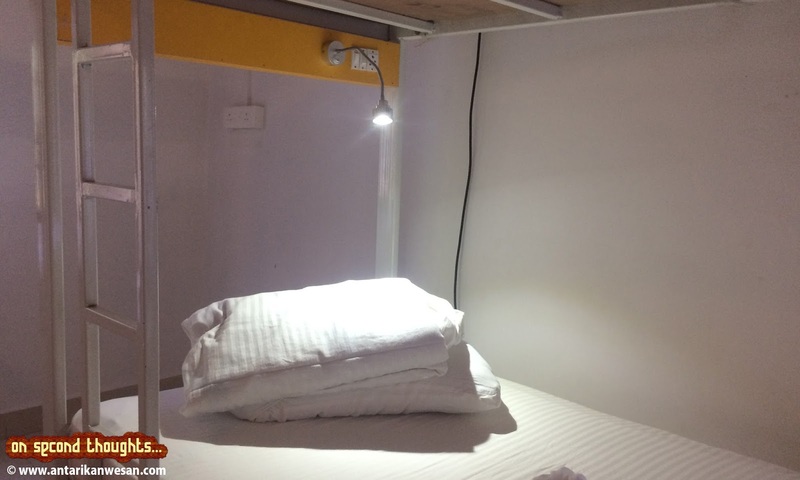 Travellers will be definitely interested in such low cost accommodations if they go through this post. This was quite informative and sounded so much fun! But tell me something, is it safe? My hisband and I often travel( we are bagpackers) and prefer economical accommodation. Is it safe? Do people get privacy here? Safety: Your luggage stays in lockers, so it's definitely safe. 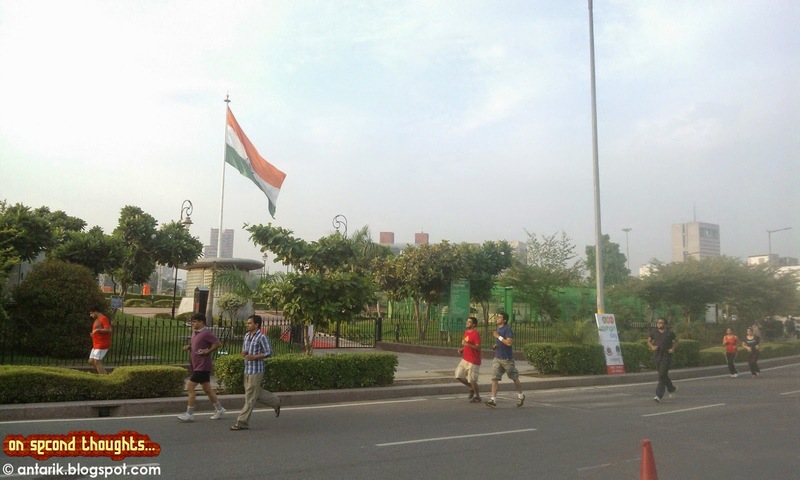 Apart from that, the place has security guard and CCTV coverage. I don't think you need to worry about security. Privacy: As mentioned in the post, the hostel has dormitories, which you would most probably share with strangers. There is a double-bed private suite as well, although I didn't check it out personally.